The slides of my lightning talk at SSTIC are available: Let’s talk about SELKS. The slides are in French and are intended to be humorous. The presentation is about defensive security that needs to get sexier. 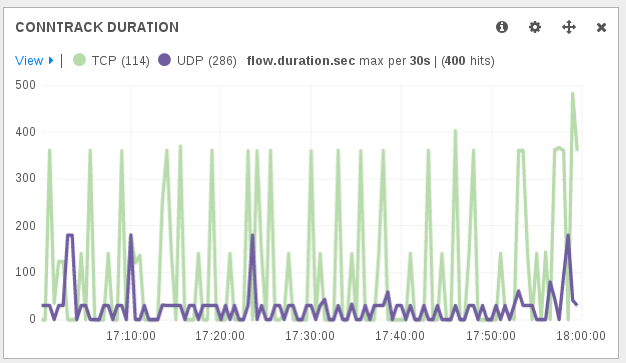 And Suricata 2.0 with EVE logging combined with Elasticsearch and Kibana can really help to reach that target. If you want to try Suricata and Elasticsearch, you can download and test SELKS. 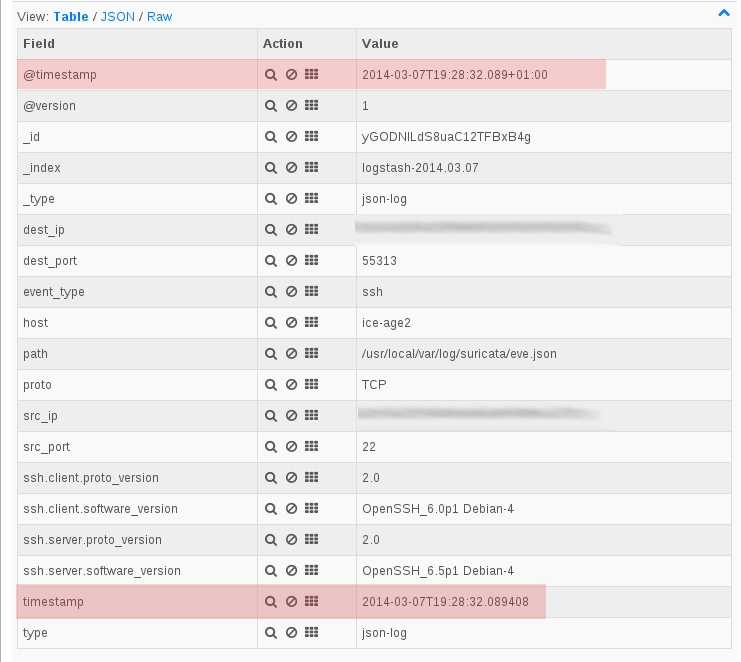 The talk also present a small tool named Deny On Monitoring which demonstrate how easy it is to extract information from Suricata EVE JSON logging. and the format of timestamp has been updated to be ISO 8601 compliant and it is now named timestamp instead of time. Ulogd, the Netfilter logging daemon has seen similar change as it is now also using a ISO 8601 compliant timestamp for the . This feature is available in git and will be part of ulogd 2.0.4. Thanks to this format change, the integration with logstash or splunk is easier and more accurate. accurate. It could even be a problem when logstash was parsing a file with old entries because the difference in timestamp could be huge. If nftables is bringing a lot of changes on user side, this is also true in the logging area. There is now only one single keyword for logging: log and this target is using the Netfilter logging framework. A corollary of that is that why you may not see any log messages even if a rule with log is matching because the Netfilter logging framework has to be configured. nfnetlink_log: netlink based logging requiring to setup ulogd2 to get the events (same module as the one used for iptables NFLOG target). It can log packet for any family. The syntax is the following FAMILY ACTIVE_MODULE (AVAILABLE_MODULES). Here nfnetlink_log was loaded first and xt_LOG was loaded afterward (xt_LOG is aliased to ipt_LOG and ip6t_LOG). Protocol family numbers can look a bit strange. It is in fact mapped on the socket family name that is used in underlying code. To update the configuration, you need to write in the file corresponding to the family in /proc/sys/net/netfilter/nf_log/ directory. Netfilter framework is used internally by Netfilter for some logging. For example, the connection tracking is using it to send messages when invalid packets are seen. These messages are useful because they contain the reason of the reject. For example, one of the message is “nf_ct_tcp: ACK is under the lower bound (possible overly delayed ACK)”. More information on the magical 255 value are available in kernel documentation of nf_conntrack sysctl. If nfnetlink_log module is used for the protocol, then the used group is 0. So if you want to activate these messages, it could be a good idea to use non 0 nfnetlink group in the log rules. This way you will be able to differentiate the log sources in a software like ulogd. This rule is accepting packet to port 22 in the state NEW and it is logging them with prefix SSH for ever on group 2. Here the group is only used when the active logging kernel module is nfnetlink_log. The option has no effect if xt_LOG is used. In fact, when used with xt_LOG, the only available option is prefix (at least for nftables 0.099). prefix: A prefix string to include in the log message, up to 64 characters long, useful for distinguishing messages in the logs. group: The netlink group (0 – 2^16-1) to which packets are (only applicable for nfnetlink_log). The default value is 0.
snaplen: The number of bytes to be copied to userspace (only applicable for nfnetlink_log). nfnetlink_log instances may specify their own range, this option overrides it. queue-threshold: Number of packets to queue inside the kernel before sending them to userspace (only applicable for nfnetlink_log). Higher values result in less overhead per packet, but increase delay until the packets reach userspace. The default value is 1. Note: the description are extracted from iptables man pages. If you want to do some easy testing with nftables, simply load xt_LOG module before nfnetlink_log. It will bind to IPv4 and IPv6 protocol and provide you logging. For more fancy stuff involving nfnetlink_log, you can have a look at Using ulogd and JSON output. I’ve recently met @aurelsec and we’ve discussed about the interest of logging connection tracking entries. This is indeed a undervalued information source in a network. Orig: here 192.168.1.129:53400 to 19.1.16.7:443. This is the packet information as seen by the firewall when it reaches him. There is no translation at all. Reply: here 19.1.16.7:443 to 1.2.3.4:53500. This is how will look like a answer coming from the server. The destination has been changed to the public IP of the firewall (here 1.2.3.4). And there is also a change of the destination port to the one used by the firewall when doing the initial mapping. In fact, as multiple client could use the same port at the same time, the firewall may have to rewrite the initial source port. So the connection tracking stores all NAT transformations. This information is important because this is the only way to know which IP in a private network is responsible of something in the outside world. For example, let’s suppose that 19.1.16.7 has been attacked by our internal client (here 192.168.1.129). If the admin of this server sees the attack, it will only see the 1.2.3.4 IP address and port source 53500. If an authority asks you for the IP address responsible in your internal network you have no instrument but the conntrack to know that this was in fact 192.168.1.129. That’s why logging connection tracking event is one of the only effective way to store the information necessary to get back to the internal IP address in case of external query. Let’s now do this with ulogd 2. Ulogd 2 is able to get information from the connection tracking and to log them in files or database. If your distribution is not providing ulogd and if you don’t know how to install it, you can check this post Using ulogd and JSON output. To be sure that you will be able to log connection tracking event, you need to have NFCT plugin to yes at the end of configure output. It is the one in charge of kernel and userspace information exchange regarding connection tracking. It provides features to dump the conntrack table or modify entries in the conntrack. For example the conntrack tool mentioned before is using that communication method to get the listing of connection tracking entries. But the feature that interest us in ulogd is the event mode. For each event in the life of a connection, a message is sent to the userspace. Ulogd is able to listen to these messages and this gives it the ability to store all information on the life of the connection in connection tracking. Our first objective will simply be to log all NAT decisions to a syslog-like file on disk. In term of connection tracking, this means we will log all connection in the NEW state. This way we will get information about any packet going through the firewall with the associated NAT transformation. If you install from sources, copy ulogd.conf at the root of ulogd sources to your config directory (usually /usr/local/etc/. And start your favorite editor on it. As you may have seen, emu1 is also used by packet logging. So it may be a good idea that we have our own output file for connection tracking event. We have changed file name and keep the sync option which permit to avoid the a delay in write due to buffering effect during write which can be very annoying when debugging a setup. The listing start with the configuration keys. One of them is event_mask. This is a the one controlling which events are sent from kernel to userspace. So default value of 5 is to listen to NEW and DESTROY events. Clever reader will then ask: why did we only see DESTROY messages in that case. This is because ulogd NFCT plugin is running by default in hash_enable mode. In this mode, one single message is output for each connection (at end) and a hash is maintained in the kernel to store the info (here initial timestamp of the connection). This is exactly what we wanted, we have a trace of all NAT transformation. By default, recent kernel have a limited handling of connection tracking. Some useful fields are not stored for performance reason. This is the case of the accounting (number of packets and bytes) and the case of the timestamp of the connection creation. The advantage of getting accounting information is trivial as you get information on bandwidth usage. Regarding timestamp, the interest is on implementation side. It allows ulogd to get all information needed for describing a connection in one single message (the DESTROY one). And ulogd does not need anymore to maintain a hash table to get the info and propagate it at exit. For following setup, you will need ulogd build from git or a ulogd at a version superior or equal to 2.0.4.
code => "if event['ct.id']; event['flow.duration.sec']=(event['flow.end.sec'].to_i - event['flow.start.sec'].to_i); end"
A thing to notice to understand the obtained duration is that a connection is dying following contextual timeout. For example, in the case of a TCP connection, even after a FIN packet there’s a timeout applied. So a short connection will at least be of the duration of the timeout. Other setup are possible. For example, you can maintain a copy of the connection tracking table in the database and also keep the history. Connection will be inserted in the table when getting the NEW event and the connection entry in the database will be updated when the DESTROY message will be received. Building a Suricata ruleset with iptables has always been a complicated task when trying to combined the rules that are necessary for the IPS with the firewall rules. Suricata has always used Netfilter advanced features allowing some more or less tricky methods to be used. With such a ruleset, all packets going through the box are sent to the IPS. But this will not work because of point 2: All packets sent via NFQUEUE to the IPS are or blocked or if accepted, leave the FORWARD chain directly and are going for evaluation to the next chain (mangle POSTROUTING in our case). With such a ruleset, the result is that there is no firewall but an IPS in place. No conflict here but you have to be sure nothing in your system will use the the mangle table or you will have the same problem as the one seen previously in the filter chain. So there was no universal and simple solution to implement an IPS and a firewall ruleset with iptables. The hook: the place in packet life where the chain will be set. See this diagram for more info. The priority: define the evaluation order of the different chains of a given hook. It is an integer that can be freely specified. But it also permits to place chain before or after some internal operation such as connection tracking. With this setup, a packet will reach the firewall chain first where it will be filtered. If the packet is blocked, it will be destroy inside of the kernel. It the packet is accepted it will then jump to the next chain following order of increasing priority. In our case, the packet reaches the IPS chain. This rule sends matching packets to 2 load-balanced queues (total 2) starting at 3 (num 3). fanout: When used together with total load balancing, this will use the CPU ID as an index to map packets to the queues. The idea is that you can improve perfor mance if there’s a queue per CPU. This requires total with a value superior to 1 to be specified. bypass: By default, if no userspace program is listening on an Netfilter queue,then all packets that are to be queued are dropped. When this option is used, the queue rule behaves like ACCEPT instead, and the packet will move on to the next table. For a complete description of queueing mechanism in Netfilter see Using NFQUEUE and libnetfilter_queue. If you want to test this before Linux 3.14 release, you can get nft sources from nftables git and use next-3.14 branch. This post explains how to configure ulogd and iptables to do packet logging and differentiate accepted and blocked packets. If you want to see how cool is the result, just check my post: Investigation on an attack tool used in China. At the time of this writing, the JSON output plugin for ulogd is only available in the git tree. Ulogd 2.0.4 will contain the feature. If the JSON plugin is not build, you need to install libjansson devel files on your system and rerun configure. All the edits are made in the ulogd.conf file. With default configure option the file is in /usr/local/etc/. The first stack will be used to log accepted packet, so we the numeric_label to 1 in set in [log2]. In [log3], we use a numeric_label of 0. Here we say we want log and write on disk configuration (via sync) and we named our device My awesome FW. be used to decide if a packet has been accepted or blocked. It this variable is set non null, then the packet is seen as allowed. If not, then it is seen as blocked. In this example, packets to port 22 are logged and accepted and thus are logged in nflog-group 1. Packet in the default drop rule are sent to group 2 because they are dropped. Once done, just point your browser to localhost:9292 and enjoy nice and interesting graphs. I’ve been playing lately with logstash using data from the ulogd JSON output plugin and the Suricata full JSON output as well as standard system logs. Ulogd is getting Netfilter firewall logs from Linux kernel and is writing them in JSON format. Suricata is doing the same with alert and other traces. Logstash is getting both log as well as sytem log. This allows to create some dashboard with information coming from multiple sources. If you want to know how to configure ulogd for JSON output check this post. For suricata, you can have a look at this one. 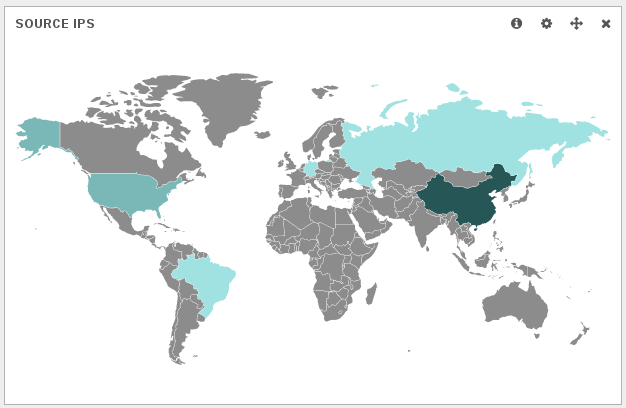 Ulogd output is really new and I was experimenting with it in Kibana. When adding some custom graphs, I’ve observed some strange things and decided to investigate. TCP window size at the start of the connection is not defined in the RFC. So every OSes have choozen their own default value. It was thus looking interesting to display TCP window to be able to find some strange behavior. With the new ulogd JSON plugin, the window size information is available in the tcp.window key. 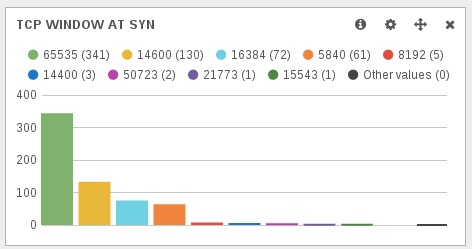 So, after doing a query on tcp.syn:1 to only get TCP syn packet, I was able to graph the TCP window size of SYN packets. 65535 is or MacOSX or some MS Windows OS. 14600 is used by some Linux. The first uncommon value is 16384. 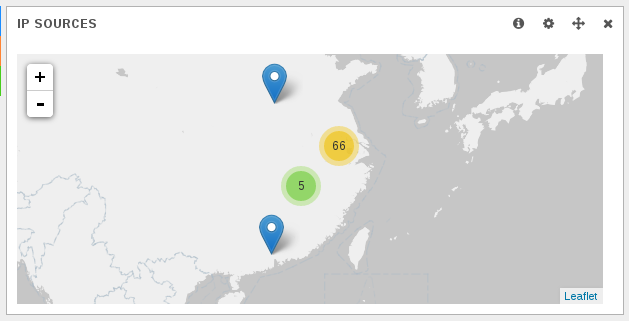 Graph are clickable on Kibana, so I was at one click of some interesting information. For all hosts, all requests are done with the same source port (6000). This is not possible to do that with a standard ssh client where the source port is by default choosen by the operating system. So or we have a custom standard software that perform a bind operation to port 6000 at socket creation. This is possible and one advantage would be to be easily authorized through a firewall if the country had one. Or we could have a software developped with low level (RAW) sockets for performance reason. This would allow a faster scanning of the internet by skipping OS TCP connection handling. There is a lot of posts regarding the usage of port 6000 as source for some scanning but I did not find any really interesting information in them. These attackers seems to really love the root account. In fact, I did not manage to find any trace of attempts for user different than root for IP address that are using the port 6000. The host scans the box using a scanner using raw socket, then it attacks with a few minutes later with SSH bruteforce tool. The bruteforce tool has a TCP window size at start of 65535. It indicates that a separated software is used for scanning. So we should have an queueing mechanism between the scanner and the bruteforce tool. This may explains the duration between the scan and the bruteforce. Regarding TCP window size value, 65535 seems to indicate a Windows server (which is coherent with TTL value). 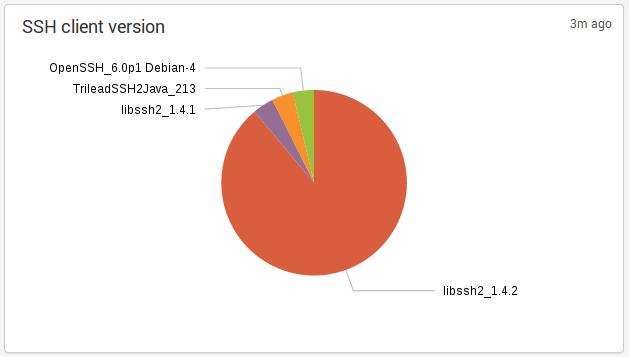 So, libssh is not a discriminatory element of the attacks. A custom attack tool has been been deployed on some Chinese IPs. 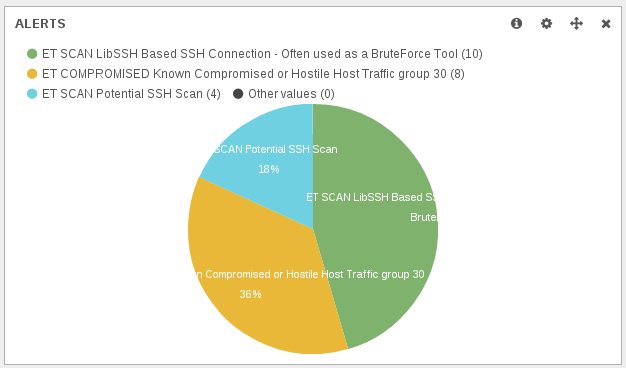 This is a combination of a SSH scanner based on RAW socket and a SSH bruteforce tool. It tries to gain access to the root account of system via the ssh service. 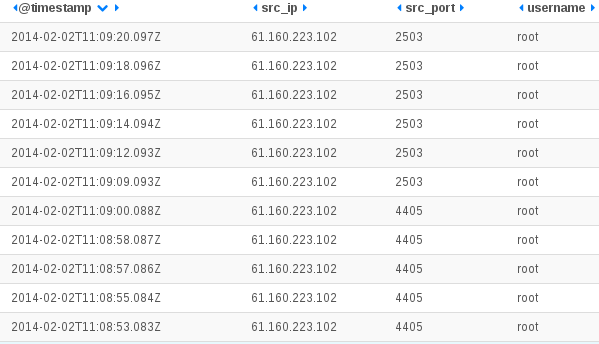 On an organisational level, it is possible there is a Chinese initiative trying to get the low-hanging fruit (system with ssh root account protected by password) or maybe it is just a some organization using some compromised Chinese IPs to try to get control other more boxes.